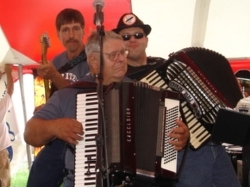 During FPB's third set on August 5th, Frank and Fritz are "havin' fun" as Fred strikes a serious pose. 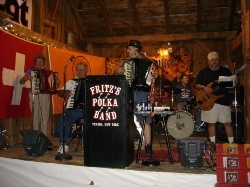 Fritz, George, Frank, and Gabe are shown here during FPB's second set on August 5, 2008 at the Chenango County Fair in Norwich, NY. 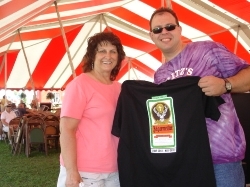 Fritz presents Marie Petry an FPB/Jagermeister t-shirt at the Chenango County Fair on August 5th. Marie gets the credit for booking FPB (Thanks, Marie!). After the Swiss Picnic wrapped up on August 3, 2008, Fritz and George went to The Hotey for an after gig party. Here, they're pictured with Dallas. Fritz is pictured here with FPB's newest fan, Dallas, at The Hotey in Verona on August 3rd. 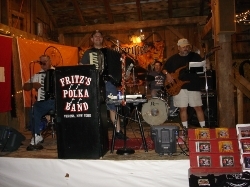 FPB Fan Club Member, Elaine Pavlick (L) sang Margaritaville with Fritz's Polka Band during FPB's 3rd set on August 3rd. Here, she's pictured with Fritz during that tune. 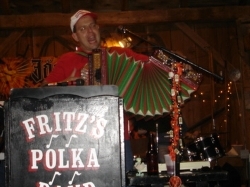 During FPB's third set at the 2008 Swiss Picnic in Boonville, NY, Fritz tears through a tune on the button-box accordion. 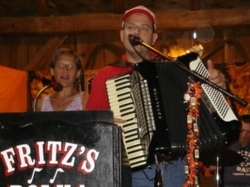 During FPB's second set, FPB Fan Club Member, Betty Miller (L) plays a tune with Fritz's Polka Band on August 3rd at the 2008 Swiss Picnic in Boonville, NY. 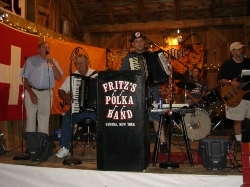 FPB Fan Club Member, Bob Zeller (L) yodels a tune with Fritz's Polka Band during FPB's second set on August 3rd at the 2008 Swiss Picnic. 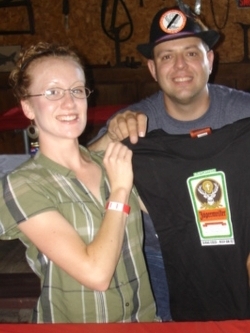 Fritz presents a FPB/Jagermeister stretchy shirt to a new FPB fan at the Swiss Picnic in Boonville, NY on August 3, 2008. 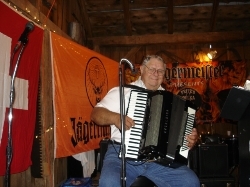 Fred and his Excelsior during Fritz's Polka Band's first set on August 3rd at the Swiss Picnic. 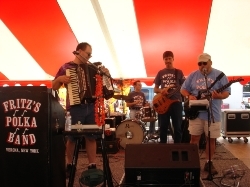 Fred, Fritz, George and Gabe tear through a tune during their first set on August 3rd in Boonville, NY. 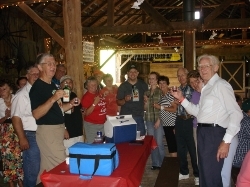 George, Fred, Gabe, and Fritz have a Jagermeister toast wit members of the FPB Fan Club on August 3rd at the Swiss Picnic. 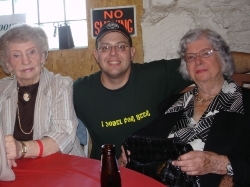 Fritz is shown here with his Aunt Alice Scherz (L) and Aunt Marie Glur(R) prior to the start of the 2008 Swiss Picnic on August 3rd. 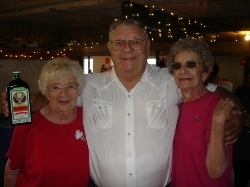 Fred poses with Marian (L) and Rita (R) prior to the start of the 2008 Swiss Picnic at Stysh's Brown Barn Campground in Boonville, NY on August 3rd.